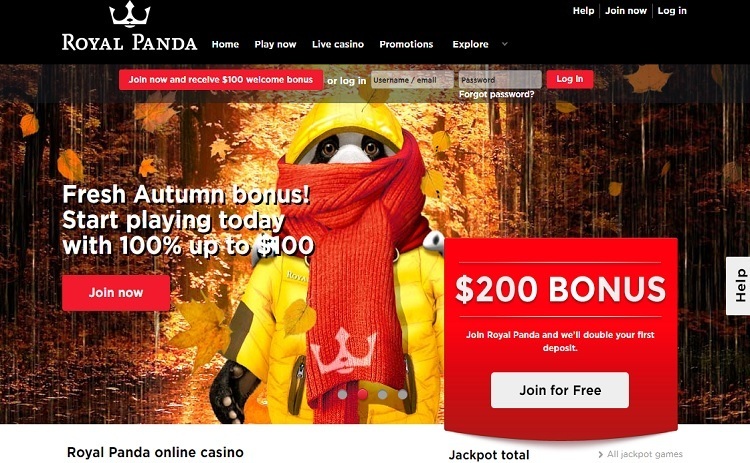 ▷ Royal Panda Casino Review for Canada  | Is Royal Panda Casino Online Legit? Royal Panda Casino Review 2019 - Is This Site Scam or Safe? A wide range of exclusive promos. French and Spanish players are not accepted. 13.1 How do I sign in at Royal Panda? 13.2 Does Royal Panda accept players from the USA? 13.3 Can I access Royal Panda on mobile? Royal Panda Casino was launched on the 28th of February, 2014. It is owned by Royal Panda Limited and affiliated with LeoVegas Casino. The company’s office is located in Malta. In this regard, the casino has a license from the Malta Gaming Authority. It is also accredited by the UK Gambling Commission and, therefore fit to serve English players. As of 2018, LeoVegas Casino controls the majority shareholding of Royal Panda. Royal Panda is an international brand with operations that run across Europe, Asia, and America. For instance, Royal Panda Casino Canada is primed for the Canadian market. Despite its youth, the gambling establishment has managed to ruffle a few feathers and made its way among the best casinos in Europe and Canada. This Royal Panda review will appraise the essential features of the casino. The restrictions occur majorly because of restrictive national legislation. As earlier stated, Royal Panda Casino is regulated by the UKGC and the MGA. These two authorities ensure that the gambling house conforms to the international rules governing the conduct of betting activities. They also ascertain that the casino maintains fair play practices and that it does not scam its customers. On a scale of 1-10, this establishment garners 9 out of 10 points for being a legit casino and a safe haven for punters worldwide. Anyone can register an account at Royal Panda Casino. All you do is fill out a simple registration form and submit your details. Your account will be active only after you verify your email address. The login credentials used to open the account will also be used to access other Royal Panda services. Royal Panda strays a little from the norm when it comes to its sign up offer. Each new player has an opportunity to claim a deposit match bonus of 100% up to 100 Pounds. However, the funds are not immediately available for the player to use. A player has to play through his/her initial deposit first before the extra funds can be accessed or withdrawn. This is called a post wager bonus. There are certain advantages to this method. For instance, most casinos that immediately avail the bonus to the player will not allow the player to access any winnings before meeting the prevailing conditions. However, at Royal Panda Casino, the player can withdraw any winnings as long as they do not devolve from the bonus amount. Specific terms have to be fulfilled before the bonus can be cashed out. The Royal Panda welcome bonus is appurtenant to a wagering requirement of 35x. Compared to other casinos, it is a pretty standard deal; neither too high nor too low. Since the bonus advanced can only total to 100 Pounds, the maximum amount needed to fulfil this rollover is 3500 Pounds. While it is not insignificant, it is on the lower side of the curve. Remember that in Royal Panda, the bonus cash does not count towards the rollover. The Royal Panda bonus is valid for 90 days during which any bonus benefactor has to have fulfilled the requirements provided. Any default will result in confiscation of the residue bonus along with any accruing winnings. No bonus codes are required to claim the bonus. Other bonuses can be claimed using vouchers and coupons. Customers can claim 300 Royal Panda free spins to use on Berryburst slots and Berryblast Max. The spins’ maximum stakes are 5 Pounds and a minimum of 0.10 Pounds. Bamboo Bonus promotion is a reload bonus that runs every Friday. Players can get 50% bonus funds on any reload made on Friday. Lucky 21 allows players to win cash rewards every 21st day of the month. The bonus is available for Royal Panda Live Blackjack. There is no Royal Panda Casino no deposit bonus. Players can accrue points each time they wager in Royal Panda Casino. The points will help the customer level up in the loyalty program. They may also be redeemed for cash rewards or for a novelty item in the Loyal Panda Shop. The software is the engine of online casinos. It is the software that makes everything in the casino possible. It is for this reason that the casino uses multiple software providers to power its platform. Microgaming and NetEnt primarily power the online casino. Microgaming products are supplied through the developer’s distribution arm called Quickfire. The two software giants mentioned provide games for the casino games section. Evolution Gaming, another powerhouse, dominates the live casino games. The Royal Panda platform is fully web-enabled. No download is required to play games or access the casino. This makes it easy to access on your desktop, iPad, or mobile device. The website is user-friendly in that it is easy for a first-time visitor to locate the various games, banking options, and promotions. Royal Panda flash games can be launched within the browser or through an app. The games use flash technology which requires nothing but a flash plug-in to launch. Unfortunately, there is no Royal Panda download software. You can only access it online. The gaming library has about 600 titles which are nothing to be awestruck about. However, the Royal Panda mobile casino offers almost five hundred games including some live dealer titles. This sets it apart from any peer casino that only offers a small fraction of their gaming library in their portable versions. The Royal Panda gaming portfolio spans over the significant casino genres to include slots, blackjack, roulette, baccarat, poker, video poker, craps, live dealer games, scratch games, and soft games. Slot games come with a variety of features such as diverse themes, soundtracks, and color schemes. However, it is a popular opinion among online slot reviews that Royal Panda slots are of excellent graphics quality and even better design functions. Free slots only avail the demo versions. Try the real money slots for all the features. This casino also offers its customers sports betting markets. Punters can make predictions in over 50 sports including football, rugby, hockey, swimming, basketball, rally, motorsport, athletics, tennis, and badminton to name but a few. Even more mesmeric is the fact that the sportsbook offers odds for esports betting with video games such as Overwatch, League of Legends, StarCraft2, Counterstrike, and Heroes of the Storm. Sports betting also accommodates live bets for a selected number of games. However, punters can only earn a maximum of 100000 Pounds a day. You would expect an online establishment of such calibre to include virtual reality games seeing as it is the new trend in town. Nevertheless, it seems that the wave has not yet hit Royal Panda. There is no mention of virtual games or any prospects of including it soon. The mobile gaming portfolio here is one of the most advanced and equipped platforms in the industry. It features approximately 500 out of the total 600 that are offered by the casino’s desktop site. The selection of games extends to include a vast live dealer portfolio. Moreover, the portable Royal Panda Casino allows access to all payment methods and the entire bankroll that falls under the main site. Games have been boosted for mobile phone use. Gamers can enjoy their favorite slots and live game online without downloading any software. In addition, the casino supports Android, iOS, and Windows operating system through a dedicated mobile application. Users with Android devices can download the apk file from the Play Store and install. iPhone and iPad users may get the app on the App Store. Customers can use their PC or Mac Royal Panda login credential to enter the mobile site. Royal Panda online casino supports a variety of international currency options. Canadian players can make payments using CAD while English players may use EUR or GBP. Other players may choose from SEK, PLN, MXN, USD, and CZK. Among the deposit, methods are Visa Card, MasterCard, Astropay, GiroPay, Zimpler, Neteller, Skrill, Sofort, Qiwi, WebMoney, PaySafe Card, Trustly, Todito, Maestro, Safety Pay, Trustpay, Instadebit, Euteller, DineroMail, Diners Club International, EcoPayz, Banklink, Bank Transfer, and AGMO. Deposits are instant. Once a customer transfers money from their bank account, it will be reflected immediately in their casino account. Withdrawals may take some time before they are completed. Players have to make cash out request first. The request will go through a verification procedure that will require the player to provide proof of address and identity. If successful, the funds will be disseminated. Withdrawal times vary with the method of payment preferred. E-wallets such as PayPal and Skrill pay out within 24 hours. Bank Transfers may take up to 10 days. The default withdrawal time is 3-5 days. The most popular withdrawal methods are Neteller, Skrill, PayPal, Visa, and MasterCard. Clients are required to deposit at least 10 Pounds in their accounts. The maximum limit defers with the means of payment. However, the most consistent limits are 10,000 and 15,000 Pounds. Players can withdraw a minimum of 10 Pounds and a maximum of 100,000 Pounds or its equivalent in other currencies. For credit and debit cards, the maximum limit is lowered to 50,000 Pounds. Apart from the usual industry SSL encryption, Royal Panda ensures security on its website by putting firewalls in place. Moreover, the casino uses anti-virus protection. Banking request has to be verified before money is paid out to the customers. What’s more, its servers are secured by Comodo Secure Software which is one of the most robust systems around. With regard to fair play, the casino uses RNGs to make the outcomes of its games unpredictable. Games are scrutinized and tested by internationally recognized bodies such as eCOGRA for fairness and payout ratios. The relevant regulatory authorities handle the complaints. Royal Panda Casino aspires to offer one of the best gaming experiences out there in the market. Although there are still a few small bumps along the road, the path is set for greater things. Players can play in Royal Panda for real money by joining the casino through its website. Royal Panda is made of winners. How do I sign in at Royal Panda? Does Royal Panda accept players from the USA? Unfortunately, the casino does not extend its services to US users. However, players from the UK are free to join. Can I access Royal Panda on mobile? Yes, you can access the casino on the phone using commercial browsers. Moreover, you can download the app for Android and iOS devices.